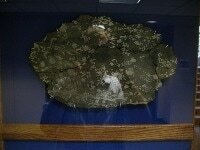 On May 10, 1879, a 455 pound meteorite fell to earth in Emmet County a few miles north of Estherville, and has become known as the Estherville Meteorite. This is the largest Meteorite that has been known to have fallen in North America. When it struck it buried itself 15 feet in the ground. Portions of the meteorite are on display in the Estherville Public Library, the Smithsonian Museum of Natural History and the Naturhistorisches Museum in Vienna, Austria. A piece of the meteorite was purchased in 2010 and now resides in the soon to open Meteorite Center in Estherville. Click here for a look at the events of that night. ​In 1980 the Estherville Area Arts Council held Estherville Sculpture Competition with the theme of the Estherville Meteorite. The winner of the competition was Tom Gibbs, a Dubuque sculptor. The sculpture was titled “Estherville Meteorite” and the Estherville Area Arts Council purchased the original model. The sculpture was placed in Library Square. A piece of the meteorite was purchased in 2010 and now resides in the soon to open Meteorite Center in Estherville. Location: 814 Central Avenue, Estherville. 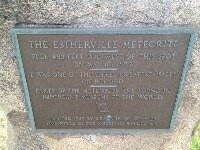 ​The meteorite landed a few miles north of Estherville. A monument located along highway 4 north marks the location spot. Want To Explore and Learn More? Come into the Chamber Office and Pick Up a Meteorite Brochure With Even More Info!